The initiative could decrease traffic while helping the environment. The tiny European nation of Luxembourg has landed itself in the international spotlight. On Wednesday the country’s prime minister, Xavier Bettel, was sworn in for his second term. At that time, his governing coalition announced a plan that would set Luxembourg apart from every other country in the world: by summer 2019, all public transport in the nation will be completely free. Luxembourg is smaller than Rhode Island, and more people live in Milwaukee, Wisconsin, than within the nation’s borders. In other words, it’s a tiny country — but that doesn’t prevent it from having a big traffic problem. Luxembourg also has the highest car-to-person rate of any nation in the European Union: 662 cars for every 1,000 people. Nearly 200,000 people from the neighboring nations of France, Belgium, and Germany commute into Luxembourg for work. Every day, the population of its capital city swells five-fold due to commuters. The hope is that eliminating all fees for public trains, trams, and buses will encourage more people to use those service. Not only would that decrease personal vehicle traffic, it would also be better for the environment. Luxembourg is small, so this initiative certainly won’t be enough to solve our global emissions problem. 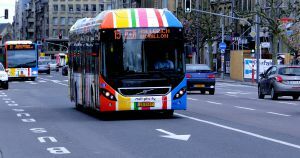 However, if commuters do decide to take the government up on its offer of free rides, other nations could see the value in following Luxembourg’s lead, making public transport free as a way to address both their own traffic woes and the damage their car-driving citizens are inflicting upon the environment.